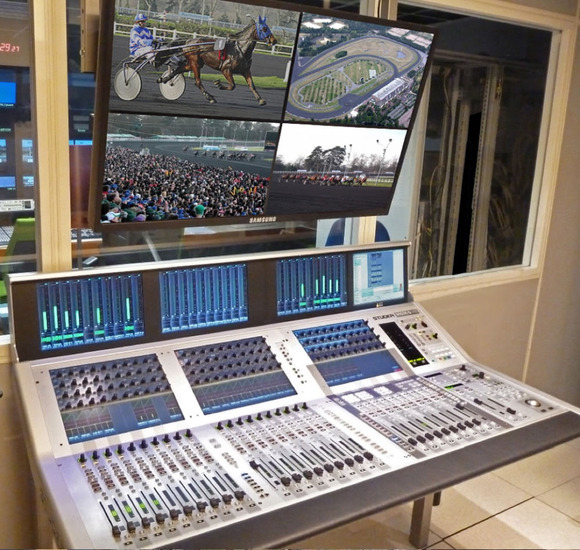 PARIS, France — The 35,000-capacity Hippodrome de Paris-Vincennes, which over the years has been as well known for hosting rock concerts as for its main purpose of horse racing, has recently upgraded its production infrastructure. One of the steps taken by the technical department was to replace its old analogue mixing console with a Studer Vista 5 M2 digital desk, configured with 32 mic/line inputs, 72 line out and eight AES I/O. This was the first sale of the new console in France (and one of the first to be shipped anywhere in the world). The large venue, with its 3000 sq metre Grand Hall, is a world famous venue for trotting events, with the jockeys pulling a two-wheel cart known as a ‘sulky’. The main track itself measures 2km in length (whereas it is generally only 800m or 1600m in other horse racing arenas). It is to these meetings, which include the famous ‘Prix d’Amerique’, that the control room itself is dedicated, while the races themselves are displayed on a 100 sq. metre large external screen, one of the largest in Europe. The venue’s management company SECF (Société d’Encouragement du Cheval Français), contacted Jean-Philippe Blanchard, Broadcast Division Director at Audiopole, the French Studer distributor, with whom they have a long association. “They were looking for an upgrade to mix the ambient sounds and commentaries within the amphitheatre, both for live playback and broadcast purposes,” stated M. Blanchard. Installation of the new Vista 5 M2 took place during the month of August when the venue was closed. Its arrival marks the start of a new era of broadcast coverage for a venue that dates back to 1879 — when it was originally built.